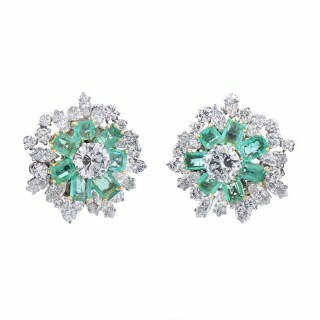 Diamond and emerald earrings, clips, the central diamonds weigh 1.5cts each (approx. ), framed by emeralds which are surrounded by a further 9.8 cts (approx.) of marquise and brilliant round diamonds. Mounted on white and yellow gold, French, signed Brunner Nancy circa 1960.